Saturday mornings in the mid- to late-1970s regularly involved time spent rummaging through the racks of Hamiltons, The Record Shop and Fearnleys. 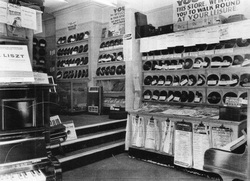 Fearnleys used to have a numbered, handwritten list of punk/new wave singles just above the counter. Happy Days.-Commnet:Gordon Baxter.